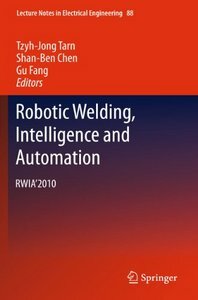 This book shows some contributions presented in the 2010 International Conference on Robotic Welding, Intelligence and Automation (RWIA’2010), Oct. 14-16, 2010, Shanghai, China. Welding handicraft is one of the most primordial and traditional techniques, mainly by manpower and human experiences. Weld quality and efficiency are, therefore, straightly limited by the welder’s skill. In the modern manufacturing, automatic and robotic welding is becoming an inevitable trend. In recent years, the intelligentized techniques for robotic welding have a great development. The current teaching play-back welding robot is not with real-time functions for sensing and adaptive control of weld process. Generally, the key technologies on Intelligentized welding robot and robotic welding process include computer visual and other information sensing, monitoring and real-time feedback control of weld penetration and pool shape and welding quality. Seam tracking is another key technology for welding robot system. Some applications on intelligentized robotic welding technology is also described in this book, it shows a great potential and promising prospect of artificial intelligent technologies in the welding manufacturing.